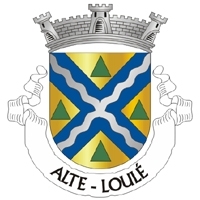 Alte is a parish (freguesia) in the municipality (concelho) of Loulé in the district of Faro (Algarve). The village, located in the changing landscape between the fertile Barrocal and the hilly Serra de Caldeirão, is surrounded by agricultural countryside along the Ribeira de Alte creek. The picturesque village of Alte, known as the most typical village in the entire Algarve, is a popular destination for excursions. The older part of the village on the hilltop, overlooking the valley of the creek, is clustered around the church Igreja de Nossa Senhora da Assunção with a remarkable doorway in the Manueline style. The architecture of the surrounding buildings is typical for the Algarve: white walled houses with decorative colouring, painted tiles (azulejos), traditional chimneys and lanes paved with local cobblestones (calçadas). In the valley below, the Ribeira de Alte is fed by two sources, the Fonte Pequena (small fountain) and the Fonte Grande (great fountain). The surrounding area with several restaurants, an open-air stage and a promenade shadowed by old trees is very appealing for a stroll or a rest. There you can also find a monument to the most famous son of Alte, the poet Francisco Xavier Cândido Guerreiro. Alte is once a year the venue of a popular race for mountain bikers, the Maratona BTT Alte. The challenging course runs through the surrounding hills up to Rocha da Pena.